]I’m teaming up with Boogie Wipes and Kandoo to spread the word about two great products – and to offer you a chance to win a $100 Walmart gift card! Whether you’re looking to fill stockings or just want to stock up for cold and flu season, these two products will have your kids begging to blow their noses and wash their hands – and they’re on Rollback at Walmart now! Head to your nearest Walmart to grab the Grape 45 ct. Boogie Wipes for just $3.46 at Walmart (when you combine the rollback with this coupon). The great grape scent will inspire even the pickiest of kids to blow their nose! 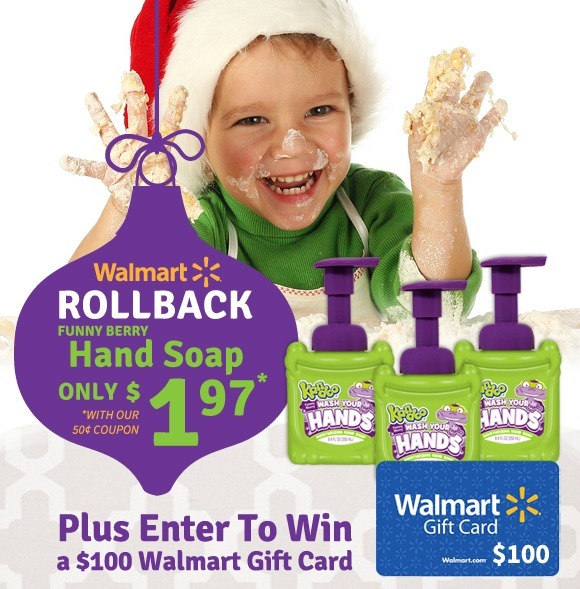 And don’t forget the Kandoo Funny Berry Handsoap for only $1.97 (when you combine the rollback with this coupon.) Your kids will love the great smell of the purple foam bubbles as they scrub their hands. Trust us – they’ll be begging to wash their hands. If you’re on Instagram, enter your information below to enter to win a $100 Walmart gift card. Giveaway ends Friday, December 19, 2014 at midnight. Good luck! For some reason, Instagram is not letting me finish following the Instagram follows. Is there a limit per day on Instagram? I’m not sure how to sign up for the giveaway. I have fixed this giveaway. It was a form I have not used before. Thanks! also if this is for USA also I am not seeing how to enter but to put in instagram down.. maybe I am tired and not seeing it loll it happens..
any help would be nice and thanks also..